O and B subdwarf Hot star with luminosity less than that of O and B DWARFS but greater than that of a WHITE DWARF. They are generally stars in the final stage of collapse to white dwarfs. OB association Group of stars of spectral type O and B. OB associations are regions of space where massive stars are currently being formed or have just recently been formed. They are one of the least dense type of star cluster. The predominance of the very luminous high-mass OSTARS and BSTARS renders OB associations recognizable at great distances, even through the dusty haze of interstellar space. Tens or hundreds of these massive stars can occur in a single association. Low-mass (faint) stars may exist in abundance too, but they are far harder to see in distant OB complexes. The Great Nebula in Orion, with its core of hot stars, is part of an OB association that is relatively close to us, hence low-mass young stars are also detected. Recent computer models suggest that OB associations could be self-perpetuating: that is, an appreciable population of massive stars can lead to the preferential formation of new massive stars. The mechanism involves the powerful stellar winds from the surrounding O stars. 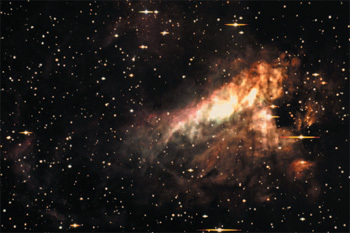 Vigorous stellar winds could disperse parental clouds, inhibiting the formation of lower-mass stars. objective LENS nearer to the object being observed in a TELESCOPE or microscope. The main mirror in a reflecting telescope can also be called the objective but this use is now uncommon. In astronomy, objective almost always means the large lens that collects and focuses the light to produce an image. A single-lens objective suffers from several ABERRATIONS, the most noticeable being CHROMATIC ABERRATION. ACHROMATS, with two lenses, and APOCHROMATS, normally with three lenses, are used as objectives in astronomical and terrestrial telescopes. objective prism Narrow-angled PRISM that is placed in front of the aperture of a telescope to produce a low-resolution SPECTRUM of every star in the field of view. Photographs taken using this instrument allow the easy and rapid spectral classification of a large number of stars to be made. Observatoire de la Cote d'Azur French research institution formed in 1988 by amalgamating Nice Observatory with the Centre for Geodynamic and Astronomical Study and Research (CERGA, which dates from 1974). Nice Observatory was founded in 1881 and equipped with a 29-inch (0.74-m) telescope named after the observatory's sponsor, Raphael Louis von Bischhoffsheim (1823-1906), which was completed in 1886. CERGA operates a 0.9-m (35-in) Schmidt telescope. Today, the observatory specializes in theoretical and observational astrophysics using facilities such as the SOLAR AND HELIOSPHERIC OBSERVATORY and the VERY LARGE TELESCOPE. observatory Any facility specifically for making celestial observations and measurements. Some structures such as Stonehenge (see ARCHAEOASTRONOMY) may well have been used for observations. The observatory proper evolved from Babylonian constructions set up for astrological observation from about 750 BC, and reached a high state of scientific development in the late 16th century with the observatories of Tycho BRAHE. The observatory as a telescope housing dates from the 17th century; notable examples are COPENHAGEN OBSERVATORY (1642), PARIS OBSERVATORY (1671) and GREENWICH OBSERVATORY (1675), founded principally for geodesy and navigation. The era of observatories built for scientific research rather than the practical needs of the state began in the 18th century. It brought about the development of large facilities such as Lord Rosse's observatory in Ireland (1845; see BIRR CASTLE ASTRONOMY), and LICK OBSERVATORY in California (1888) and YERKES OBSERVATORY in Wisconsin (1897) with their great refractors. The first half of the 20th century saw a continuing dominance of the USA in large telescope building with MOUNT WILSON OBSERVATORY's 100-inch (2.5-m) and PALOMAR OBSERVATORY's 200-inch (5-m) reflectors, completed in 1917 and 1948, respectively. With the arrival of frequent and rapid air travel in the 1960s, optical astronomers were no longer restricted in where to locate their observatories, and the next decade saw a proliferation of telescopes in the 4-metre class on excellent remote sites. The post-war years also saw a growth in the number of large radio telescopes, and the first proposals for observatories in space to overcome the limited range of wavelengths available to astronomers on the Earth's surface. Today, the turn-of-the-century boom in 8-10-metre class telescopes is well under way, and a new generation of optical-astronomy institutions such as the GEMINI OBSER-VATORYand the W.M. KECK OBSERVATORY is emerging. The modern observatory is often far from its telescopes, either because of the geographical remoteness of the observing site (as with the EUROPEAN SOUTHERN OBSERVATORY) or because the observatory operates a space facility (as with the SPACE TELESCOPE SCIENCE INSTITUTE). Increasingly important are observatories dedicated to popular astronomy. These range from the private observatories of amateur astronomers (some of which, like their 18th-century forebears, challenge the smaller professional observatories in the quality of their equipment) to major educational facilities such as the FAULKES TELESCOPE. Public education and outreach is giving a new lease of life to the older facilities of professional observatories, whose working astronomers now use newer telescopes elsewhere. A good example is the 0.91-m (36-in.) reflector of the ROYAL OBSERVATORY, EDINBURGH (1928), which is now the centrepiece of the observatory's Visitor Centre. occultation Event in which one body is obscured by another - in other words, when a distant object is hidden by a nearer one. An obvious example is a SOLAR ECLIPSE, which is, strictly, an occultation of the Sun by the Moon. The term occultation can be applied to a range of celestial objects, but the most commonly observed are lunar occultations, which occur as the Moon obscures stars during its passage along the band of the ECLIPTIC. The most readily observed lunar occultations are disappearance (immersion) events, occurring on the Moon's leading (easterly) limb before full. At this time, the leading limb is dark; occultations occurring when the Moon is a waxing crescent may be especially favourable for observation, with the limb dimly visible by EARTHSHINE as it approaches the target star. Inexperienced observers are often surprised by the suddenness with which the star vanishes: this is due to the Moon having no atmosphere and the star being at such a great distance that it is virtually a point source of light. After full moon, reappearance (emersion) events are more readily observed, occurring at the dark trailing lunar limb. As with disappearances, these events occur very abruptly. Successful observation depends on good predictions, including an accurate forecast of the POSITION ANGLE on the Moon's limb at which reappearance will take place. Visual study of lunar occultations has been undertaken for over a century, and still plays a role in astronomy. Precise timings of events, coupled with precise positional data for the observing location, provide useful information on the Moon's orbital motion. Timing accuracy can be further improved by the application of video recording techniques. High-speed photometry has also been used to obtain light curves for stars during immersion, allowing identification of previously unknown close double stars and measurement of the diameters of some of the nearer stars. In the course of a year, the Moon may occult more than 4000 stars in the range of a fairly standard amateur telescope. Good star catalogues and modern computing capabilities make the calculation of predictions relatively straightforward. Observational reports are collected by the International Lunar Occultation Centre in Japan for reduction, and the resulting data are available for use by professional astronomers. Stars are not the only bodies to be occulted by the Moon; on occasion, a planet or asteroid may also be occulted. In the case of Jupiter, the planet's own satellite system can be seen to be occulted. The major planets, being very much closer than the stars, show disks, so that occultations are gradual, lasting several seconds; the brightness of Venus, Mars, Jupiter and Saturn allows events occurring at the Moon's bright limb to be observed quite readily. Occultations of the planets, while rare and yielding less scientific data than those involving stars, can be spectacular to watch in a small telescope or binoculars. A spectacular planetary occultation was observed from central England on 1980 October 4, when, in the pre-dawn sky, Venus was grazed by the Moon's limb, being only partially obscured. Lunar mountains and valleys were seen in profile against Venus' bright gibbous disk. Graze occultations for a star can be seen along a track no more than 1 km (0.6 mi) wide on Earth's surface and are consequently rare. Teams of observers spread perpendicular to a graze track can obtain multiple timings of events as the Moon's irregular limb alternately covers and reveals the star, gaining much useful information about the lunar profile. Planets may also, on rare occasions, occult stars. Brightening and fading of stars during immersion or emersion can provide information about planets' atmospheric layering. Among noteworthy events was the occultation of 28 Sagittarii by Saturn and its rings on 1989 July 3. The following night, Saturn's satellite Titan occulted the star in an event seen extensively from Europe, with a brightening at mid-occultation resulting from refraction of starlight by Titan's dense atmosphere. The rings of Uranus were discovered during an occultation of the star SAO 158687 on 1977 March 10. At certain times, when the plane of their orbits aligns with Earth, Jupiter's Galilean satellites may undergo mutual occultations. They are also, of course, frequently seen to be occulted by Jupiter itself as they pass behind it on their orbits. Occultations of stars by asteroids are also rare, but provide extremely valuable opportunities to determine the profiles of these small bodies. Essentially, an asteroid casts a 'shadow' equivalent to its diameter (usually less than 200 km/120 mi) as it occults a star. The critical observation in these cases is whether an occultation occurs at all, and its duration (defining a cord across the asteroid's diameter). Secondary occultations have revealed the presence of satellites orbiting some asteroids, including (6) Hebe, (18) Melpomene and (532) Herculina. occulting disk Small metal disk placed in the focal plane of a telescope to cover a bright object in order that a fainter one may be observed. An occulting disk is used in a CORONAGRAPH to produce an artificial eclipse of the Sun. It blocks the light from the Sun's disk and enables observations to be made of the fainter CORONA. The Infrared Astronomical Satellite (IRAS) also made use of an occulting disk to block out the direct light from stars, allowing it to image the infrared radiation from their surrounding regions. ocean The Conamara Chaos region of Jupiter’s satellite Europa, imaged from the Galileo orbiter in 1997. 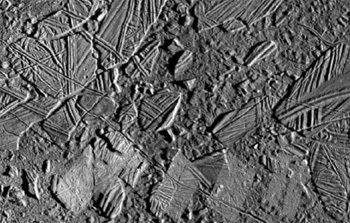 These irregularly shaped blocks of ice are thought to overlie and occasionally be moved by a deep liquid ocean beneath Europa’s surface. OCTANS (gen. octantis, abbr. oct) and is almost free of impact craters, indicating that it is geologically young. Some Europan landforms strongly resemble icebergs frozen into crushed ice. The youth of Europa's surface suggests that the currently observed icy crust may conceal a great body of liquid water. There is also evidence, from its electromagnetic response to Jovian magnetosphere fluctuations, that ganymede may harbour great bodies of salt water. Constellation containing the south celestial pole, but otherwise unremarkable. Octans was created in the 18th century by Lacaille to commemorate the octant, an early form of navigational instrument that was the forerunner of the sextant. Its brightest star is v Oct, visual mag. 3.73, distance 69 l.y., spectral type K0 III. sigma octantis, mag. 5.45, is the nearest naked-eye star to the south celestial pole. ocular Alternative name for an eyepiece, now seldom used. Odysseus Impact crater on Saturn's satellite tethys; its diameter is 440 km (270 mi). Odysseus is the largest known crater in the Solar System, relative to the size of the body on which it is found. off-axis guider Optical arrangement whereby a guide star close to but outside a telescope's field of view can be used to ensure that the instrument remains accurately aligned with the target during imaging. A mirror or prism may be used to acquire the light of the guide star, which is then directed to a small telescope for manual guiding, or to an autoguider. In off-axis guiding, the guide star cannot itself be imaged. Of star ostar whose spectrum contains emission lines of helium (at 468.6 nm) and doubly ionized nitrogen (463.4 and 464.0 nm) as a result of high luminosity and some chemical change caused by early evolution. O(f) stars have only a weak 468.6 nm line, while O((f)) stars have nitrogen in emission but ionized helium strongly in absorption. Of* stars display a strong [NIV] line. OH Hydroxyl radical, the first interstellar molecule to be discovered at radio wavelengths (18 cm), in 1963. There are four components to the line (at frequencies 1612, 1665, 1667 and 1720 MHz). In some places one component of the line may be enhanced up to a million times the expected strength by maser action. OH maser sources are associated with late-type stars and hii regions. Olbers, Comet 13P/ Short-period comet discovered on 1815 March 6 by Wilhelm Olbers, Bremen, Germany. An elliptical orbit was calculated for the comet by Friedrich Bessel, this being revised following recovery, some months later than expected, by William Brooks (1844-1921) at the next return in 1887 August. At the most recent return, in 1956, 13P/Olbers reached peak magnitude +5.6. The orbital period is 69.56 years. Olbers, (Heinrich) Wilhelm (Matthaus) (1758-1840) German physician and amateur astronomer, now best known for the paradox named after him. He was one of the celestial police who searched for the supposed missing planet between the orbits of Mars and Jupiter, discovering two of the first four asteroids, Pallas (1802) and Vesta (1807). He also found several new comets, but more importantly invented a new method of calculating a comet's orbit from just three observations of its position. Although he was not the originator of olbers' paradox -Edmond Halley mentioned it, and the Swiss astronomer Philippe de Cheseaux (1718-51) gave essentially the same explanation as did Olbers - it was Olbers' name that became attached to it, following his discussion of it in a paper published in 1823. He was tireless in encouraging others, and set Friedrich Wilhelm bessel on his career. Olbers' paradox Paradox discussed in 1826 by Heinrich olbers (although it had been raised earlier by, for example, Edmond Halley) when he posed the question 'Why is the sky dark at night?' If space were infinite and uniformly filled with stars, then in whatever direction the observer were to look he or she would eventually end up looking at the surface of a star and so the entire sky should be as bright as the surface of the Sun. The paradox can be resolved in various ways. For example: if the Universe is not sufficiently old, light from the more remote objects cannot yet have reached us; or the expansion of the Universe ensures that radiation emitted by galaxies is weakened by the redshift and cannot be detected beyond a certain range. Olympus Mons Most spectacular shield volcano in the Solar System. Situated at 18°.6N 134°.0W on the northwestern flank of the tharsis montes on mars, it rises some 24 km (15 mi) above the surrounding plains and is more than 700 km (430 mi) in diameter. It comprises a central nested caldera 80 km (50 mi) across, from which the terraced flanks slope away at angles of only 4°. The flanks are traversed by numerous lava flows and channels with a roughly radial arrangement. In many respects Olympus Mons is similar to terrestrial basaltic shields like those of Hawaii, but with a volume that is between 50 and 100 times greater. Towards the north and south ends of the main shield, lava flows drape a prominent peripheral escarpment, which, in places, forms a cliff 6 km (4 mi) high. Numerous landslides degrade this cliff and spread out on to the adjacent plains. The flows themselves are very long compared with terrestrial flows, a phenomenon that may be explained either by very high eruption rates, very large-volume eruptions, or a combination of the two. Surrounding the shield is a wide and very complex region of lobate ridged terrain which is termed the 'aureole'. In places the aureole extends 700 km (430 mi) from the basal scarp. Olympus Mons A Viking mosaic image of Olympus Mons, the Solar System’s largest volcano. 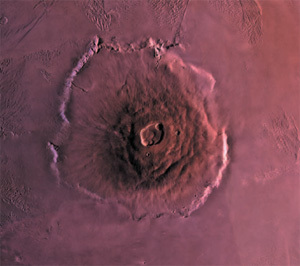 The summit caldera is about 80 km (50 mi) across, while the gently sloping flanks cover an area 700 km (430 mi) wide on the Tharsis Montes region of Mars. Omega Centauri (NGC 5139) Brightest globular cluster in the Galaxy, found in the southern constellation of Centaurus (RA 13h 26m.8, dec. —47°29'). It is visible to the naked eye as a fuzzy star, and it received a stellar designation before its true nature was realized. omega Centauri is of mag. 3.7, and it is about 40' in diameter, with a broad, bright central region. Its brightest stars are 11th magnitude. At 17,000 l.y. away, it is one of the nearer globular clusters. It contains several hundred thousand stars in a volume 200 l.y. across. omega Centauri is intrinsically the brightest globular cluster in the Galaxy. It is noted for wide variations in the heavy element ('metal') content of its stars, suggesting that they were formed at different times. Some 200 variable stars have been found in the cluster. Omega Nebula (M17, NGC 6618) emission nebula and associated open star cluster in the constellation Sagittarius (RA 18h20m.8 dec. —16°11'). It is also known as the Swan Nebula or Horseshoe Nebula. The nebula has angular dimensions of 20'X 15' and mag. 6.0. Its true diameter is 27 l.y., and it lies 6800 l.y. away. Omega Nebula Also known as the Swan Nebula, M17 in Sagittarius is part of a huge complex of emission nebulosity in the direction of the galactic centre. It contains about 800 solar masses of material. Onsala Space Observatory Swedish national facility for radio astronomy located 48 km (30 mi) south of Gothenburg, and operated by Chalmers Institute of Technology. It has a 25-m (82-ft) telescope that can be used independently or in very long baseline interferometry (VLBI), and a 20-m (66-ft) dish for millimetre-wave observations. The observatory also operates the swedish eso submillimetre telescope. Oort, Jan Hendrik (1900-1992) Dutch astronomer who investigated the structure and dynamics of our Galaxy and others, was one of the first to use radio astronomy to study the Galaxy, and put forward the 'Oort cloud' theory of the origin of comets. After studying at Groningen under Jacobus kapteyn he joined the University of Leiden, where he spent the rest of his working life, becoming professor of astronomy in 1935 and director of Leiden Observatory in 1945. In the late 1920s, building on work by Kapteyn and Bertil lindblad on the structure of the Galaxy and our position within it, Oort showed from statistical studies of stellar motions that the Sun is 30,000 l.y. (a better value than Lindblad's 50,000 l.y.) from the galactic centre and takes about 225,000 years to make one revolution. From this he calculated that the Galaxy contains around 100 billion solar masses. He also introduced the oort constants to describe stellar motion. After World War II, Oort and Hendrik van de hulst recognized the potential of the newly emerging techniques of radio astronomy. In 1951 they discovered the twenty-one centimetre line in the spectrum of interstellar neutral hydrogen (hi regions) that van de Hulst had predicted seven years before. Neutral hydrogen pervades the Galaxy, and the 21-cm emission passes through interstellar dust clouds that block visible light, so Oort and his colleagues were able to map the Galaxy, revealing its spiral arms. In 1950 Oort proposed that comets reside in a huge shell-like region a light-year or so from the Sun, and that gravitational perturbations occasionally send a comet sunwards. This region is now known as the oort cloud. In 1956 he and Theodore Walraven (1916- ) found that radiation from the Crab Nebula is highly polarized, characteristic of synchrotron radiation. Oort cloud Spherical halo of comet nuclei gravitationally bound to and surrounding the Sun to a distance of 100,000 AU (a third of the way to the next closest star), proposed by the Dutch astronomer Jan Oort in 1950. While direct evidence for the existence of the Oort cloud is currently impossible to obtain, the idea is widely accepted as an explanation for the observed frequency and orbital characteristics of new long-period comets. 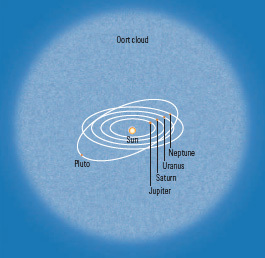 The Oort cloud is believed to contain a population of up to 1012 comet nuclei. Gravitational perturbations by passing stars may dislodge Oort cloud nuclei from their distant orbits, causing them to fall sunwards and perhaps to pass through the inner Solar System, where they can become spectacular new comets. Oort cloud An artist’s impression of the spherical Oort cloud of cometary nuclei, surrounding the Solar System to a distance of 100,000 AU. Nuclei from this vast reservoir may be perturbed into orbits carrying them close to the Sun. A new comet of this nature may return to the far depths of space on a long-period orbit (as, for example, was the case with C/1996 B2 hyakutake, which is not expected to return for 14,000 years). If its path takes it close to one of the planets, particularly Jupiter, a comet may have its orbit modified to one of short period. Refinements of the model from the 1950s onwards led to the suggestion that the Oort cloud may become more concentrated towards the ecliptic plane at distances of 10,000 to 20,000 AU from the Sun, extending inwards to join the edgeworth-kuiper belt. Some Solar System dynamicists propose that residence in the Kuiper belt is an intermediate stage between the initial inwards fall from the Oort cloud and appearance as a new long-period comet. Oort constants Two constants invented by Jan oort to describe the motions of stars around the Galaxy. The orbital motions of stars mean that nearby stars are moving with respect to the Sun. For example a star that is closer to the centre of the Galaxy and behind the Sun will have a relative velocity that on average causes it to move towards the Sun and away from the centre of the Galaxy. opacity Measure of the ability of a semi-transparent medium to absorb radiation. It is given by the ratio of the intensity of the emergent radiation to that of the incident radiation. The reciprocal of opacity is transmittance. A commonly used related quantity is the optical depth, t, given by t = — loge. An optical depth of 1 corresponds to the apparent surface of a semi-transparent object or region such as the solar photosphere. open cluster Loose irregularly shaped star cluster, containing from a few tens to a few thousand members. An open cluster may be regarded as a localized region of enhanced star density as compared to its immediate surroundings. A few open clusters have been known since antiquity, including the HYADES, the PLEIADES and PRAESEPE. Several star clusters were included in the MESSIER CATALOGUE, and still more are found in the new general catalogue (NGC). The stars belonging to a cluster not only lie close together in space but also share a common origin; they generally travel together through space, although they also to some extent move within the cluster. A sometimes severe problem in studies of stellar clusters, especially in star-rich regions, is the separation of true cluster members from field stars in the same region of the sky. Open clusters are much less rich in stars than GLOBULAR CLUSTERS. They sometimes contain no more than a few tens of stars, and seldom more than a few thousand. A typical radius for an open cluster is about 10 l.y. The distribution of stars may vary considerably from cluster to cluster, but it is never as concentrated towards the centre as in globular clusters. Open clusters are susceptible to disruption, not only through members becoming free of the gravitational influence of the group but also through tidal forces from the Galaxy or encounters with interstellar clouds. Only the richest clusters may survive more than 109 years, while the smallest and least tightly bound do not last more than a few million years. Their hazards are strengthened by their being found only near the galactic plane, which is the reason for the older designation 'galactic clusters'. The number of known open clusters in our Galaxy is nearly 1200, but this is certainly only a very small fraction of the total number. As all stars in a cluster take part in the general motion of the cluster, it is possible to derive the distances of nearby clusters by the MOVING CLUSTER method. Ophelia One of the small inner satellites of URANUS, discovered in 1986 by the VOYAGER 2 imaging team. Ophelia is about 32 km (20 mi) in size. It takes 0.376 days to circuit the planet, at a distance of 53,800 km (33,400 mi) from its centre, in a near-circular, near-equatorial orbit. With CORDELIA it acts as a SHEPHERD MOON to the planet's Epsilon Ring, Ophelia being just outside the orbit of that ring. 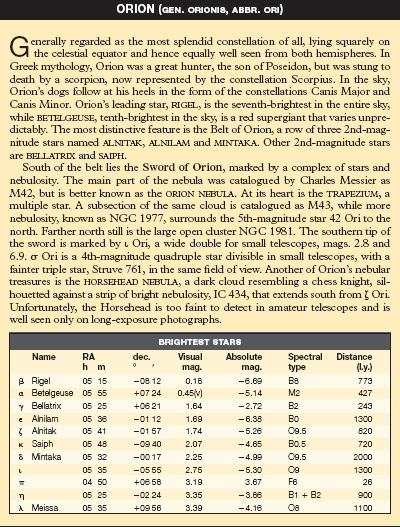 OPHIUCHUS (gen. ophiuchi, abbr. oph) Large but ill-defined constellation of the equatorial region of the sky. It represents Aesculapius, a son of Apollo and a mythical healer, holding a huge snake, a symbol of regeneration. The snake is represented by the constellation SERPENS, which is divided into two, one half each side of Ophiuchus. 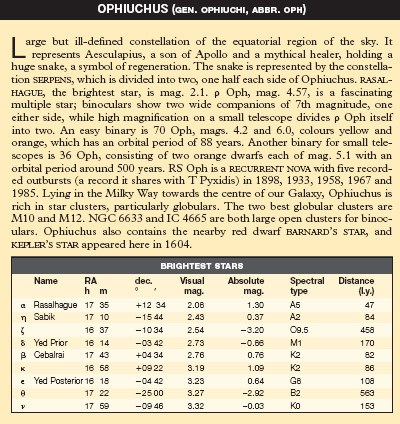 RASAL-HAGUE, the brightest star, is mag. 2.1. p Oph, mag. 4.57, is a fascinating multiple star; binoculars show two wide companions of 7th magnitude, one either side, while high magnification on a small telescope divides p Oph itself into two. An easy binary is 70 Oph, mags. 4.2 and 6.0, colours yellow and orange, which has an orbital period of 88 years. Another binary for small telescopes is 36 Oph, consisting of two orange dwarfs each of mag. 5.1 with an orbital period around 500 years. RS Oph is a RECURRENT NOVA with five recorded outbursts (a record it shares with T Pyxidis) in 1898, 1933, 1958, 1967 and 1985. Lying in the Milky Way towards the centre of our Galaxy, Ophiuchus is rich in star clusters, particularly globulars. The two best globular clusters are M10 and M12. NGC 6633 and IC 4665 are both large open clusters for binoculars. Ophiuchus also contains the nearby red dwarf BARNARD'SSTAR, and KEPLER'sstar appeared here in 1604. Ophiuchids Minor METEOR SHOWER (zenithal hourly rate no higher than 5) that peaks around June 20, with activity from late May until July. The radiant is just south of t) Ophiuchi. Opik, Ernst Julius (1893-1985) Estonian astronomer, an expert on stellar evolution and meteors, who made contributions to almost every field of astronomy; many of his bold predictions were later proved to be true. He helped to found Tashkent (Uzbekistan) University during World War I, returning to Estonia to head the astronomy department at the University of Tartu. In 1948 he fled to Northern Ireland, and spent the rest of his career at Armagh Observatory. In 1910 Opik discovered that o2 Eridani was a white dwarf star; two decades later (1938), he showed how main-sequence stars like the Sun can evolve into red giants. From a study of the orbits and perturbations of comets, he predicted that they reside in a cloud extending to 60,000 AU from the Sun, an idea later revived by Jan Oort (see OORT CLOUD). Opik studied the ablation of meteoroids passing through the Earth's atmosphere, knowledge later used to design heat shields that protect spacecraft during re-entry. Oppolzer, Theodor (Egon Ritter) von (1841-86) Austrian mathematician and astronomer who calculated the time and track of every lunar and solar eclipse from 1207 BC to AD 2163. This work was published posthumously (1887) as the Canon der Finsternisse ('Canon of Eclipses'). Oppolzer was professor of celestial mechanics at the University of Vienna and published over 300 papers on the orbits of comets and asteroids. He devised a new theory to explain the lunar motion, which was taken into account by later researchers in this field, including E.W. BROWN. optical double DOUBLE STAR, the components of which appear to lie close together as seen from Earth but are actually totally unconnected. Optical doubles appear close together due to a line-of-sight effect, but in reality the stars often lie at great distances from each other. optical interferometer Instrument that combines the light from two or more light paths to produce high-resolution images or spectra. When two or more light beams from the same object are combined, any small differences due to the separate paths along which they have travelled cause the beams to interfere with each other. This interference gives rise to patterns of dark and light which can be measured to analyse the differences producing them. The earliest example of an optical interferometer used in astronomy is that which enabled Albert Michelson (1852-1931) and Francis PEASE to measure the angular diameter of Betelgeuse as 0".047 in 1920. It consisted of a 6-m beam mounted on the front of the 100-inch (2.5-m) Mount Wilson reflector. Two movable mirrors on the beam directed two light beams from Betelgeuse on to the telescope, where they were combined in an interferometer. By moving the mirrors, Michelson and Pease determined the separation at which the fringes just disappeared and from this they calculated Betelgeuse's angular diameter. Radio astronomers routinely use the INTERFEROMETRY principle to construct arrays of telescopes that can resolve detail equivalent to that attainable by a single reflector with a diameter equal to the separation of the telescopes in the array. The same method can be used by optical astronomers but is much more difficult to achieve. Recent developments have led to several observatories designing optical interferometers based on existing and new telescopes. For example, ESO's VERY LARGE TELESCOPE (VLT) will one day operate as an optical interferometer using its four 8-m (315-in.) telescopes in conjunction with an array of smaller telescopes around 1.8 m (71 in.) in diameter. Similarly, there are plans to combine the two 10-m (390-in.) Keck telescopes with several 2-m (79-in.) telescopes to form an interferometer. orbit Path of a celestial body in a gravitational field generated by other bodies. There is usually a single dominant primary body, and the path is basically an ELLIPSE around the primary body, which is located at one of the foci of the ellipse. In rare cases the orbit may be a PARABOLA or a HYPERBOLA. The size, shape and orientation of the orbit are described by the ORBITAL ELEMENTS. The attractions of other bodies in addition to the primary body cause PERTURBATIONS to the orbit. orbital elements Describing the size, shape and orientation of an ORBIT, and the position of the orbiting body in the orbit at some EPOCH. There are six orbital elements, and if the mass of the primary body is not know (such as in a binary star system) then the orbital period (or the mean motion) is also needed. In addition, the epoch of the elements is usually specified. The elements vary slowly with time as a result of perturbations by other bodies, and the epoch is the time at which they had the particular values specified. orbital elements The orbit of a planet around the Sun can be defined by a number of characteristics, including the inclination (i) relative to the reference plane of the ecliptic, the longitude () of the ascending node measured in degrees from the First Point of Aries, and the argument of perihelion () measured in degrees from the ascending node. q = a (1 — e) the distance from the primary at peri-centre. Only six of these quantities are needed to define an orbit. For the planets and natural satellites, it is usual to take as the orbital elements the quantities a, e, i, X, tO, ft. 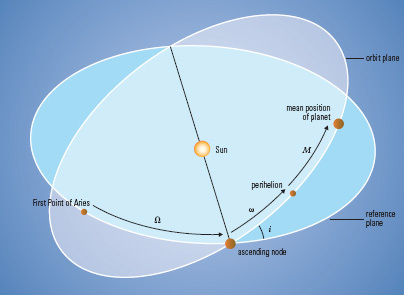 The reason for choosing the composite angles X and O rather than M and co is that for many planets and satellites the inclinations are small, and so the node is not a well-defined point (for the Earth the inclination to the ecliptic of date is zero, and so the node is not defined at all). It is preferable, therefore, to measure all angles from the well-defined equinox. For asteroids and artificial satellites of the Earth the inclinations are generally fairly large, and so the node is well defined. In this case the orbital elements are usually taken as the quantities a, e, i, M, co, ft. In either case, the quantities X or M vary rapidly as the object moves around its orbit, and so the epoch of the elements is an important quantity. For comets and newly discovered asteroids the perihelion distance and the time of perihelion passage are usually of particular interest, and so these are taken as two of the orbital elements. The full set used is T, q, e, /, co, ft. As the mean longitude or mean anomaly at epoch is not used, the epoch of the elements is of lesser importance than it is for planetary elements. orbiter Any spacecraft that makes at least one revolution around a Solar System body. If the spacecraft is injected into a polar orbit, the whole surface of the body can, in general, be scanned by cameras and other instruments. The first spacecraft to orbit the Moon was the Soviet luna 10 in 1966. The first planetary orbiter was NASA's mariner 9, which went into orbit around Mars in 1971. Orbiting Astronomical Observatory (OAO) Series of US astronomical satellites launched 1966-72. The first was a failure, but OAO-2 and OAO-3 (known as copernicus) made ultraviolet observations of stars and interstellar matter. OAO-3, which operated for nine years, also carried a UK X-ray instrument which made important observations. Orientale, Mare (Eastern Sea) Farside lunar lava plain with rings extending on to the visible western limb of the Moon. It is the most extensively studied multi-ring impact basin on the Moon, because it is the youngest and so has the best-preserved ring system. The eastern aspects of the rings are visible during a favourable libration. Long after the impact, lunar basalts tracked up underlying faults and flooded the inner region of this basin, producing Mare Orientale. Extensive scarring from this basin's ejecta is visible on western limb craters. Orion Arm (Orion Spur) Segment of one of the spiral arms of the galaxy within which our Solar System is situated. The arm curves away from the galactic centre, starting near Cygnus, passing Orion and ending near Puppis and Vela. But in fact all the brighter naked-eye stars, plus the orion nebula,are within the arm. The Solar System is on the edge of the arm closest to the centre of the Galaxy. The Orion Arm is probably a branch off one of the main spiral arms of the Galaxy, and so is perhaps better called by its alternative name of the Orion Spur. Orionids meteor shower, active between October 16 and 30, produced by debris from Comet 1P/halley encountered at the ascending node of its orbit. The maximum is broad, over a couple of days around October 20-22, and shows some variation in timing from year to year, presumably as a result of the meteor stream's filamentary nature. Peak zenithal hourly rate (ZHR) is typically around 25 meteors/hr, but slightly higher activity has been seen on occasion, as in 1993. Outstanding displays may have occurred in ad 288 and 1651. Orionid meteors are swift (66 km/s or 41 mi/s) and a high proportion leave persistent trains. The shower radiant appears to have a complex structure, and it lies midway between Betelgeuse and y Geminorum. A further encounter between Earth and the meteor stream in May produces the eta aquarids. Generally regarded as the most splendid constellation of all, lying squarely on the celestial equator and hence equally well seen from both hemispheres. In Greek mythology, Orion was a great hunter, the son of Poseidon, but was stung to death by a scorpion, now represented by the constellation Scorpius. In the sky, Orion's dogs follow at his heels in the form of the constellations Canis Major and Canis Minor. Orion's leading star, rigel, is the seventh-brightest in the entire sky, while betelgeuse, tenth-brightest in the sky, is a red supergiant that varies unpredictably. The most distinctive feature is the Belt of Orion, a row of three 2nd-mag-nitude stars named alnitak, alnilam and mintaka. Other 2nd-magnitude stars are bellatrix and saiph. South of the belt lies the Sword of Orion, marked by a complex of stars and nebulosity. The main part of the nebula was catalogued by Charles Messier as M42, but is better known as the orion nebula. At its heart is the trapezium, a multiple star. A subsection of the same cloud is catalogued as M43, while more nebulosity, known as NGC 1977, surrounds the 5th-magnitude star 42 Ori to the north. Farther north still is the large open cluster NGC 1981. The southern tip of the sword is marked by i Ori, a wide double for small telescopes, mags. 2.8 and 6.9. Ori is a 4th-magnitude quadruple star divisible in small telescopes, with a fainter triple star, Struve 761, in the same field of view. Another of Orion's nebular treasures is the horsehead nebula, a dark cloud resembling a chess knight, silhouetted against a strip of bright nebulosity, IC 434, that extends south from Ј Ori. Unfortunately, the Horsehead is too faint to detect in amateur telescopes and is well seen only on long-exposure photographs. Orion Nebula A colour composite of infrared images taken with the Very Large Telescope (VLT) at Cerro Paranal, showing the central region of the Orion Nebula. The four bright, young Trapezium stars are prominent in the middle of this view. The Orion Nebula is a region of ongoing star formation. Orion Nebula (M42, NGC1976) hii region that is easily visible to the naked eye as the central object in the sword of orion (RA 05h 35m.4 dec. -05°27'). The main part of the nebula is separated from a smaller part of the same cloud, known as M43 or NGC1982, by a dark absorbing region called the fish's mouth. The nebula surrounds, and is excited by, the four young stars of the trapezium (also known as 91 Ori). The nebula is about 1500 l.y. away on the nearer side of the orion molecular clouds and is little more than the inside of an incomplete spherical hole in the side of the much larger dark nebula. The Orion Nebula is over a degree across on the sky and thus some 25 to 30 l.y. in physical size. Its mass is several hundred times that of the Sun. orrery Geared mechanical model of the Solar System. The first orrery, probably that preserved in the Adler Planetarium, Chicago, was made by the English instrument-maker George Graham (c.1673-1751) in about 1708. The name is usually attributed to John Rowley, who made a similar instrument for Charles Boyle (1676-1731), 4th Earl of Cork and Orrery, in c.1712. Many 'grand orreries' up to 1 m (3 ft) in diameter, showing the motions of the six known planets and their satellites, with clockwork movements, were made in England during the 18th century. From about 1775, hand-driven portable orreries came on the market, often with alternative fittings so that an orrery could be a 'planetarium', 'tellurium' or 'lunarium', as desired. orthoscopic eyepiece Telescope eyepiece designed to give good definition, little geometric distortion and comfortable eye relief. It consists of two elements - a single eye lens that is normally plano-convex, and a cemented triplet that is normally symmetrical. This arrangement produces an apparent field of view of 40° to 50°, which is smaller than other popular designs such as the plossl. Orthoscopic eyepieces are sometimes preferred by planetary observers looking for good performance at high magnification. Oschin Schmidt Telescope World's first large schmidt telescope, completed in 1948, with a 1.2-m (48-in.) corrector plate and a 1.8-m (72-in.) spherical mirror. Formerly known as the Palomar Schmidt, and renamed after the benefactor Samuel Oschin, the telescope is sited at palomar observatory and operated by the california institute of technology. It became famous in the 1950s for producing the palomar observatory sky survey. Photographic plates from the survey were used to identify targets for the nearby hale telescope. In 1984 the Oschin Schmidt was fitted with a new achromatic corrector plate in preparation for a new survey of the northern sky. Today, it is used with a CCD camera to search for near-earth objects. oscillating universe Idea that if the universe is closed it will eventually collapse back to an infinitely small point, an event sometimes called the 'Big Crunch'. It is conceivable that a new big bang could follow the Big Crunch and create a brand new universe. This cycle could in principle repeat itself, alternately creating, then destroying and finally creating a new universe each cycle. osculating orbit orbit that a celestial body would continue in if all perturbing forces from other bodies were instantaneously cut off, leaving just the gravitational attraction of the primary body. The elements of this orbit are the osculating elements, and are mathematically equivalent to the instantaneous position and velocity. The current planetary ephemerides are generated by a numerical method that gives instantaneous position and velocity at each time step. These can be converted into osculating elements to give a more meaningful representation of the orbit. They can be used for calculating the position of the body at any required time, and are very accurate close to the epoch of the elements, and still reasonably accurate (0°.01) up to one year from the epoch. Osculating elements of the planets are tabulated in The Astronomical Almanac. O star Any member of a class of blue-white stars, the spectra of which are defined by absorption lines of ionized helium. Neutral helium lines are present in the cooler subclasses, while those of hydrogen remain strong. O stars lie at the extreme hot end of the main sequence. Dwarf subclasses range from 32,000 K at O9.5 to 50,000 K at O3 (the earliest defined); zero-age masses range from 16 to perhaps 120 solar masses (the upper limit is not well known); zero-age luminosities range from 30,000 solar to over 2 million; dwarf lifetimes are from 10 million years to only 2 million. Higher luminosity MK classes are recognized in part by the weakening of the ionized helium absorptions. As O dwarfs evolve, the more massive ones become O giants and supergiants. The high luminosities result in line-driven winds that can eventually cut the stellar masses by large fractions. As a result, O stars commonly have emission lines in their spectra. Those with hydrogen emission are called Oe stars, while those with ionized helium and doubly ionized nitrogen are of stars. Emission line and 'Of' behaviour increase with increasing luminosity. Ultraviolet (and even optical) p cygni lines reveal wind speeds of up to 4800 km/s (3000 mi/s) and mass-loss rates of up to 10~5 solar masses per year. As O stars evolve, the lower masses turn into class M helium-fusing supergiants. Above about 60 solar masses, however, high mass-loss rates make the stars' evolutionary paths stall as B supergiants and luminous blue variables, which then become Wolf-Rayet stars that have been stripped of their outer hydrogen envelopes. As evolution proceeds past helium fusion, O stars develop iron cores that collapse to produce Type II supernovae, whose stellar remains become neutron stars or black holes. As a consequence of both low formation rates and short lifetimes, O stars are rare. Less than one of every 3 million main-sequence stars is an O star. The odds of finding one nearby are small, and most are very far away. Short lifetimes also mean that O stars do not move far from their birthplaces, and they are commonly associated with star-forming interstellar clouds of gas and dust. 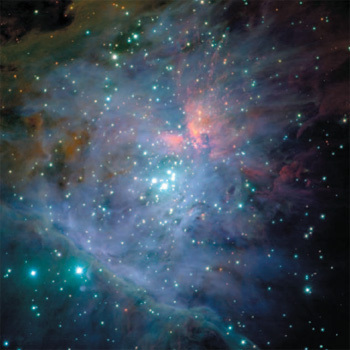 Since their high temperatures result in hard ultraviolet radiation, O stars can ionize their surroundings and create diffuse nebulae; the most famous is the Orion Nebula, which is ionized by the Trapezium quartet. Because star formation takes place in the Galaxy's disk, O stars are found almost exclusively along the Milky Way, the relatively nearby ones helping to create Gould's Belt. Most O stars are members of unbound ob associations (from which they are moving away), the best known concentrating in Orion, Scorpius, Centaurus and Perseus. A good fraction of O and B stars form in binary systems, many with components of similar mass. Encounters between stars in multiple systems, or between pairs of close binaries, can eject individuals from the associations at high velocities. Supernovae may also create such runaway stars. In a double star, the more massive star evolves first and explodes. Supernovae can explode off-centre, which can drive the resulting neutron star away at high speed, the companion fleeing in the other direction. It is estimated that as many as 20% of the O stars are runaways; the best known are u Columbae and AE Aurigae, which were ejected from the Trapezium cluster 2.5 million years ago. O stars, plus those of classes B0 to B1, produce much of the ionizing radiation that energizes the thinner interstellar clouds. Their high mass-loss rates also return a great deal of matter to the interstellar medium (red giant winds and planetary nebulae producing the bulk). Since the stars are being stripped by winds, much of this matter has been processed by energy-generating nuclear reactions to create new helium, nitrogen and carbon. The eventual supernovae then produce most of the heavy elements in the Universe, including all the iron. Moreover, the shock waves from wind-blown O star bubbles and from the eventual supernovae aid in the compression of the interstellar gases, and therefore help form new stars. Examples of O stars include Ј Puppis 05 Ia, g Persei O7.5 Iab, 8 Orionis 09 V, Ј Orionis 09 Ib and Ј Ophiuchi 09 V.
outer planets Any of the planets with orbits that lie beyond that of the asteroid belt; the outer planets are Jupiter, Saturn, Uranus, Neptune and Pluto. With the exception of Pluto, the outer planets have low densities in comparison to the inner, terrestrial planets and possess ring systems and comparatively large numbers of satellites. The differences between the two types of planet are thought to be caused by their respective distances from the Sun during the early formation of the Solar System. outgassing Emission of volatile material from planetary bodies. Terrestrial bodies, formed from primeval Solar System material, contained volatile material. When these bodies were heated by radioactivity, differentiation occurred, and some of the volatile material escaped to the surface. This process, termed 'outgassing', produced planetary atmospheres. Overwhelmingly Large Telescope (OWL) Largest optical telescope yet proposed: a 100-m (330-ft) aperture instrument whose reflecting surface would be formed by 1600 hexagonal mirror-segments, each 2.3 m(91 in.) across. The technique of multi-conjugate adaptive optics would enable OWL to provide diffraction-limited images with a resolution of 0".001. This would reveal surface features on nearby stars and emission nebulae in the most distant known galaxies. OWL is not yet funded, but was the subject of a concept study by the european southern observatory in 2000. Owens Valley Radio Observatory (OVRO) World's largest university-operated radio observatory, near Bishop, California, some 400 km (250 mi) north of Los Angeles. Operated by the california institute of technology, OVRO has a 40-m (130-ft) telescope, a millimetre-wavelength array consisting of six 10.4-m (34-ft) dishes, and a solar array. Owl Nebula (M97, NGC 3587) planetary nebula in Ursa Major, located a couple of degrees south-east of p, the lower of the 'Pointers' (RA 11h 14m.8 dec. +55°01'). The Owl, at mag. +9.9, is one of the fainter objects in Messier's list. Its 3'.4 circular profile contains a couple of dark patches, or 'eyes', which give it a resemblance to an Owl's face, hence its popular name. The nebula has an estimated age of 6000 years, and it lies 2600 l.y. away. The central star is of mag. + 16.
oxygen (symbol O) Element that is the third most abundant in the Universe (see astrochemistry). Its properties include: atomic number 8; atomic mass of the natural element 15.9994 amu; melting point 54.8 K; boiling point 90.2 K. It was discovered in 1774 by the English chemist Joseph Priestley (1733-1804). Oxygen has eight isotopes ranging from oxygen-13 to oxygen-20; three of these are stable and form the naturally occurring element (oxygen-16 99.8%, oxygen-18 0.2% and oxygen-17 (0.1%). Oxygen comprises 21% by volume of dry terrestrial air. Under normal terrestrial conditions, it exists as a colourless, odourless gas composed of the diatomic molecule O2. In this form it is essential to aerobic life. It is also essential to life as water, when it is combined with hydrogen, and as the carbohydrates, when combined with hydrogen and carbon. Oxygen makes up about two-thirds of the human body. The allotrope of oxygen, O3, known as ozone, is present in small quantities high in the atmosphere, where it absorbs solar ultraviolet light at wavelengths shorter than 320 nm. It thus protects life on the surface from that damaging radiation. The ozone layer though is currently being depleted to dangerous levels, particularly over the polar regions, through the action of man-made fluorocarbons and other pollutants. Oxygen is a highly reactive element and is thus an important constituent of the Earth and other terrestrial planets in the form of oxides of silicon, calcium, iron, aluminium and others. It makes up 49% by mass of the Earth's crust. It is used in liquid form as part of the fuel for liquid-fuelled rockets. Oxygen plays an important role in the carbon—nitrogen—oxygen cycle, which is the major helium-producing nuclear reaction in stars more massive than the Sun. Oxygen burning to produce silicon occurs at temperatures over 2 X 109 K (see nucleosynthesis) in high-mass stars.